This beautiful Fairy Lights in navy blue wedding invite is perfect for a casual and elegant wedding celebration. A beautiful string of large festoon lights in a crisp white finish contrast against the navy background of this wedding invite. The romantic white script text completes the look with elegant flair. 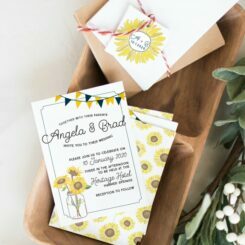 Everything is printed onto your choice of a beautiful sturdy cardstock and comes complete with a deluxe envelope for sending to your lucky wedding guests. There’s something truly magical about the way that a simple string of fairy lights can transform a space. Sitting with a glass of wine, the only light from the fairy lights, enjoying the music and the company of friends and family is one of my favourite places to be at a wedding. Recommended card stock: Our Standard 300gsm Card works beautifully with this design. This beautiful Fairy Lights in navy blue wedding invite is perfect for a casual, modern and elegant wedding celebration. The main wedding invite is 99 x 210mm with your choice of optional informational or RSVP card. This pictured invite includes a separate card with information about a wedding wishing well. This is a great way for guests who want to wish you well, to contribute a little something.